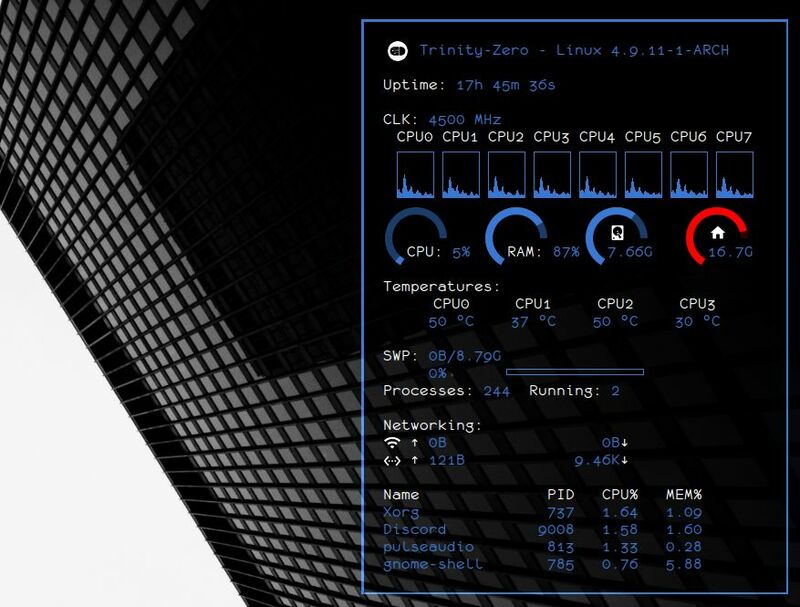 Conky, the popular system monitor/widget for Linux, has been around forever, but recently I’ve had the pleasure of rediscovering it. Let’s see how conky is doing in 2017. 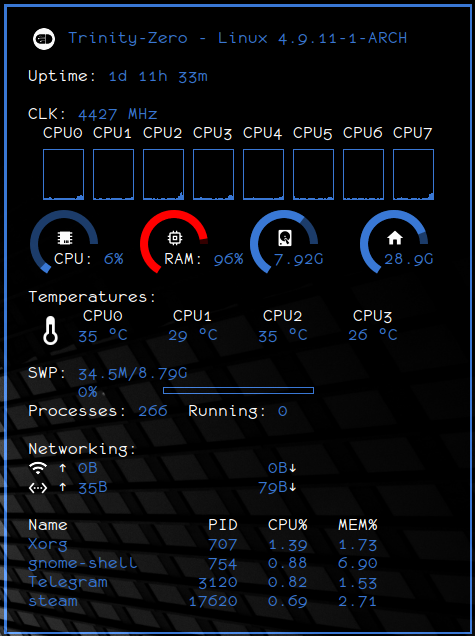 So, one of the reasons I got back to conky is that I needed a simple and low profile way to monitor the temperatures of my newly acquired i7-6700K CPU. In fact I am pretty new to the world of overclocking and I want to make sure that my CPU runs nice and cool at all times. Initially I was running psensors on my secondary monitor, but that was far too invasive since it compromised my workflow. Then I remembered the old days when conky was the way to go for monitoring anything in a fashionable way. I was pretty sure that the project was dead, but a quick Google search led me to this GitHub repository, and I was pleasantly surprised to see that it is still in active development! After trying some of the themes that I used in the old times, and getting every single one of them to fail miserably, I discovered that conky uses a new configuration file syntax based on Lua since version 1.10, and even if old themes should work, they actually don’t (at least in my experience). I tried to find some newer themes, but since I couldn’t I decided to make my own, and to this point I can say I’m pretty happy with the result. Well, it’s not as fancy as other themes I’ve used in the past, but it blends in nicely with my desktop, and most importantly I have all the stats I need under control! I will update this post when I am 100% satisfied with the conky, and post a link of my configuration, so stay tuned for that! And what about you? What do you think of conky? Do you use it? If so, share your configs down in the comments, I’m sure they’re worth a look! I think my current configuration is worth sharing, you can download it from this github repository.